I remember always having an undying love for Idlis, maybe because I love eating the Idlis with Podi or because my brother hated them. Even now he hates Idlis. During childhood, it was always like this, if he likes something, I will not like it and made a point to always pick a fight with him. But he never budges for anything. Oh how I longed to have a sibling who will do the proper thing and fight with me. I used to hear tales from my friends about their fights with their sister or brother and I used to go back home with the built up fury to pick a fight with my brother. But everything goes flat because he just never falls pray to that. I had a very dull childhood with no fights with him nor any other dispute. This went to such a greater extent that I used to argue with my mom, saying he never fights and I was feeling left out of the drama. She used to find all this very amusing and asked if I purposely deny eating what he likes. Yes, he used to like ven pongal, so I never liked it and almost never ate it until high school. Name a vegetable he doesn't like and I will love that. He is a very reserved, calm person and of course, now I know what a wonderful person he is, but during childhood, I hated him because he wasn't like the normal brother you would expect and fight with me. So all you gals and guys who have memories of sibling fighting, I envy you all! 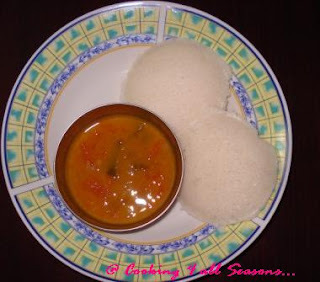 For Idly, we always make only onion sambar with coconut chutney. Amma makes a red chilli chutney which I simply love. It's just red chillies, with ghee and Idli, it's a topper! Since I don't have a picture I will save that for another day. But let me talk about our onion sambar. We don't like any other vegetable added to the sambar we make for Idlis, it's plain Sambar, Onions Sambar! As I have said many times, my in laws love the idlis with the sambar and chutney that Amma makes, so the first day of their arrival is always a bucketful of Sambar and Idlis for them. Let it ferment for 10 hrs or overnight. Next morning, first thing you can do is to mix the batter once again and let it rest. For best soft idlis, don't mix again when you pour into the moulds. Just gently pour down into each mould. Keep for 15 mins for getting cooked and serve hot with Vengaya Sambar! Vengaya Sambar ~ Small Onion Sambar! Clean Toor Dal and pressure cook it with 2 drops of Oil and turmeric. Put it on for 2 whistles or till the dal is cooked. Remove and let it cool down. Soak Shallot (Sambar onions) for 5 mins, this way the skin comes out easily. We normally don't chop the onions very finely. It remains as big bulbs. Chop Onions and tomatoes. Heat oil in a pan, add the seasoning ingredients. Then add chopped onions. Sauté till they are cooked, add tomatoes, Sambar powder and salt. Cook till the tomatoes are soft. Then add the tamarind pulp and water. Let it come to a boil. Then add the cooked toor dal. The dal should be well cooked. Cook the sambar on high flame for 5 mins, then simmer for 10 mins till its cooked well. This plate of Hot Idlies with Spicy Onion Sambar is our healthy eats in the morning. So this is on its way to Tasty Palettes. Suganya wont say no for healthy idlis I am sure.